For offices and educational establishments, there’s no shortage of difficult decisions to make when it comes to your AV. Whether it’s the placement of your speaker set up or whether to opt for a short-throw or traditional data projector, there are lots of decisions to be made – many of which have much larger consequences than you might imagine. As a leading AV supplier and installer, we’re inundated with questions from customers about which products they should be buying and which they should be avoiding. One particularly common question we encounter regards the size of the projector screen they should opt for. Common sense dictates that you should invest in the largest projector screen your budget and room will accommodate, but that’s flawed thinking. 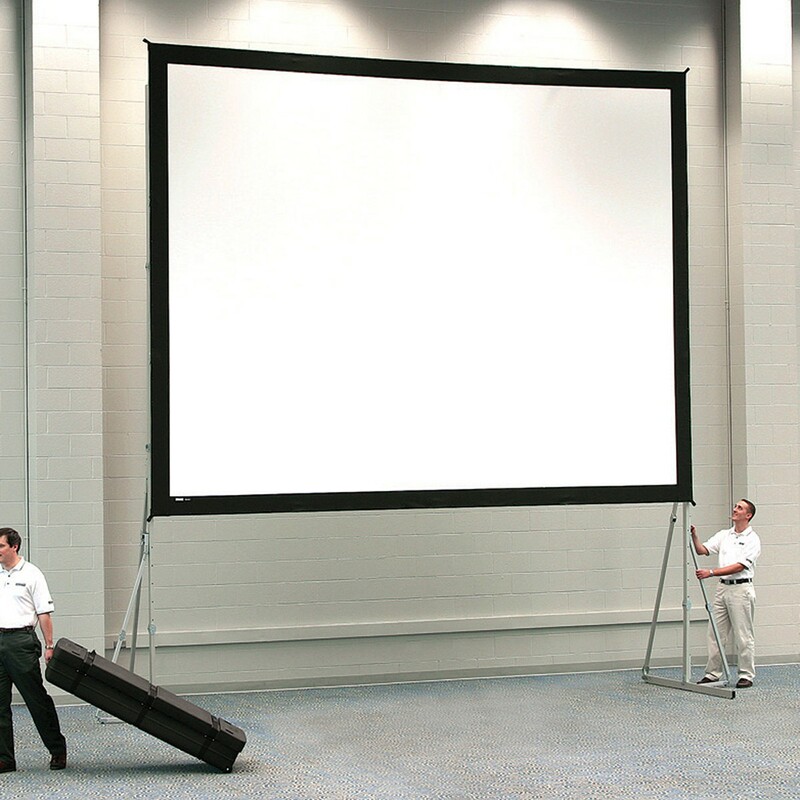 In this article, we’re going to share with you the pros and cons of large projector screens. When you’re projecting an image to a room full of people, it’s vital that everyone in a space can see it just as well as everyone else. With a larger projector screen, everything on screen is just bigger. It may seem like an obvious point, but it’s a valuable one none the less. Our desire for every larger screens exists not just in projector screens, but in our smartphones, computers and televisions too. Quite simply, it seems we’re just attracted to larger screens than smaller ones. More screen means more space to show off multiple things. Whether it’s a PowerPoint presentation alongside charts and graphs, a video running alongside concept artwork or multiple instances of a web browser running at the same time, the fact that large projector screens have space for more stuff remains a huge selling point for them. Every projector has a specific lumen output. That dictates how bright the image is coming out of the projector. Much like a torch, the smaller area it has to light, the brighter it becomes. As such, the larger the image you project, the darker it will become. For projectors designed with a high lumen output, this isn’t much of an issue. If, however, you don’t have a particularly powerful projector, attempting to project a very large image can result in a dark, hard to see image – especially in the day time. Ask anyone who’s ever been stuck with the seat closest to the screen at a cinema and they’ll tell you that trying to take in information when you’re sat very close to a big screen is an exercise in frustration. For this reason, large projector screens are best used in rooms with lots of floor space. Much like the screen on your smartphone or your television, projectors have resolutions which they output at. The higher the resolution, the more detail that’s able to be projected. For large projector screens, you need higher resolution projectors, otherwise, the image becomes muddy and lacking in sharpness. It’s an additional cost, but a 4K projector with a large projector screen enables incredibly sharp, detailed and large images.